Over the past couple of decades, Domperidone has fallen in and out of grace with varying countries. With certain problematic side effects, and numerous medications it can interact with, Domperidone’s efficacy hasn’t always had the best track record. However, there are still many patients whose symptoms and potential benefits outweigh the problematic risks associated with Domperidone—making it a medication that can still be prescribed—even in the United States. The key is to know how to go about getting the medication in whatever country you live in. For those in Canada and other countries, a simple prescription may be all you need to acquire this once over-the-counter medication. Let’s take a closer look at what Domperidone is prescribed for, as well as how to go about ordering the medication online, regardless of where you live. Domperidone has been around since the 1970s and was originally manufactured and developed by Janssen Pharmaceuticals. The medication has been prescribed over the years to relieve nausea or vomiting in patients with certain GI disorders, as well as reducing the GI symptoms of Parkinson’s Disease. The medication works on GI symptoms by helping to move food through process of being digested more quickly—in turn, providing relief from nausea and vomiting—or other digestive upset. It should be used at its lowest effective dosage and for the shortest duration possible to limit any side effects and/or risks (typically no more than one week). Patients suffering from motion sickness may also find relief with Domperidone, thanks to its ability to calm the stomach and speed digestion. There is an active clinical trial underway, trying to determine if treatment with Domperidone may help with Secondary Progressive Multiple Sclerosis. The clinical trials began in 2015 and are estimated to wrap up in 2020. Domperidone has been used to increase breast milk production for women whose milk supply is low, thanks to its prolactin induction. However, due to the various cardiac risks, it is not generally recommended for this usage. That being said, if the potential benefits for milk supply and baby’s wellbeing outweigh any of the risks, doctors may still prescribe Domperidone to help. If you’re a nursing mother who believes milk production is a problem, talking with a lactation consultant would be the first step to increasing milk supply, as they may have alternative methods to make this happen. It could even be a matter of improper latching and/or lack of practice if you’re a first-time mom. Be sure to talk to your doctor if you feel you may need to take Domperidone to increase milk production—or if you are already taking this medication and are pregnant, considering becoming pregnant, or nursing. You’ll want to discuss and weigh any risks and benefits associated with taking this medication, so you don’t inadvertently harm yourself or your baby. In the past, there have been concerns regarding the potential health risks associated with those taking Domperidone for extended periods of time, and in particular, intravenously. The medication was associated with the risk of causing cardiac issues such as arrhythmias, cardiac arrest, and even sudden death for those with higher levels of the medication in their blood. Though much of the risk is carried by those who are older and very sick (or have a predisposition to cardiac issues). In addition to the cardiac risks associated with this medication, it also has a variety of medications it may interact with—and that list is growing every day. Drug interactions with Domperidone include antifungals, antibiotics, antidepressants, HIV inhibitors, MAO inhibitors, antacids and other medications used to treat GI conditions. This wide array of interactions can make it a minefield for knowing whether or not a patient may experience harmful side effects—and most people without a medical or pharmaceutical background simply wouldn’t have the information to make a wise, educated decision about its usage. 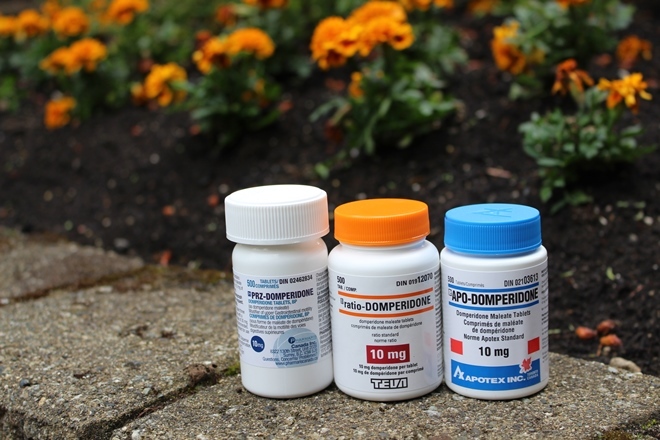 Those at highest risk for complications while taking Domperidone include: pregnant or nursing mothers, those over 60 years old, anyone taking a higher dosage of the medication (30mg or more), those with predisposing factors for QT prolongation, those with cardiac conditions or history of cardiac arrest or congestive heart failure, anyone with an electrolyte imbalance, those with moderate to severe liver impairment, and anyone receiving QT-prolonging medications and potent CYP3A4 inhibitors. How can you get domperidone from an online Canadian Pharmacy? While most patients who live in the United States cannot fill a prescription for Domperidone within the US, there are still ways to obtain the medication. Patients over the age of 12 are allowed to be treated with Domperidone, even in the US, provided they have one of the approved GI conditions that responds well to this treatment. However, before being treated with Domperidone, American patients would most likely have to have tried (and failed) standard therapies for their GI or milk supply issues to be eligible. While Domperidone had been an over the counter (OTC) medication in many 1st world countries, ten years after it was removed from the shelves in America, the Medicines and Healthcare products Regulatory Agency (MHRA) announced Domperidone would be a prescription-only medicine. Any non-prescription Domperidone products were recalled within 48 hours of the September 4, 2014 notice. The move was a response to a European Medicines (EMA) review, declaring Domperidone to put those taking it at risk for those serious cardiac side effects already discussed. The European review believed medical intervention was likely necessary in order to identify patients who may have increased cardiac risks when on the medication—as well as identifying those suitable for treatment with Domperidone. Domperidone may not be available for many people without a prescription, or without ordering it online. If you live in the United States and require a Domperidone prescription to be filled, foreign dispensary pharmacies, such as Canadian Pharmacy King, may be your best option for getting the medication you need. For those looking to fill their prescription of Domperidone, it is available at Canadian Pharmacy King in the brand name tablet form by Janssen, known as Motilium, as well as generic versions, such as PRZ-Domperidone, manufactured by Pharmaris Canada—as well as others—all fulfilled by our Canadian, Indian, and United Kingdom dispensaries. As an added bonus, the Pharmaris and Apotex versions are both lactose free and gluten free. The Teva Pharmaceuticals generic version is also gluten free. CPK offers flexible quantities: 100, 200, 300, 400, 500, 750, and 1000 and our lowest price is $0.149 for the generic version. Need more information on how to order with us? Check out our ‘How to Order” page for all the details you may need to get your prescription of Domperidone filled as quickly as possible. If you would like to take a closer look at other Canadian pharmacies dispensing Domperidone, check out PharmacyChecker’s list for a comprehensive comparison. While Domperidone is no longer wholly recommended for breastmilk production, nor technically available in the United States, there are circumstances where it’s a viable—and even a recommended option. Those with certain, untreatable GI conditions, or seriously low prolactin levels, may have no other choice. For those patients, we’re here to help get your prescription of Domperidone fulfilled and on its way to you. Should you find yourself in the position to need Domperidone, Canadian Pharmacy King is ready to help. Should you have questions about how you can go about getting your prescription of Domperidone fulfilled with us, give us a call at 1-877-745-9217. We’d be happy to walk you through the process and discuss your options with you.